, called Father Plumier, being a religious, of the order of Minims, was born at Marseilles, April 20, 1646, and was a botanist not less famous than his contemporary Plukenet. He entered into his order at sixteen, and studied mathematics and other sciences at Toulouse, under father Maignan, of the same society. He did not only learn the profound sciences, but became an expert mechanic. In the art of turning he became such a proficient as to write a book upon it and learned also to make lenses, mirrors, microscopes, and other mathematical instruments, all which knowledge he gained from Maignan. He was soon after sent by his superiors to | Rome, where, by his application to mathematics, optics, and other studies, he nearly destroyed his constitution. As a relaxation from these severer sciences, he applied to botany, under the instruction of father Serjeant, at Romey of Francis de Onuphriis, an Italian physician, and of Sylvius Boccone, a Sicilian. 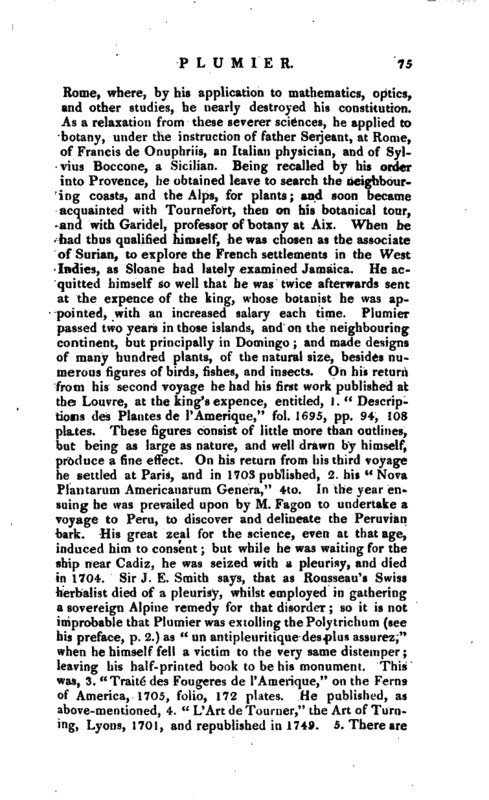 Being recalled by his order into Provence, he obtained leave to search the neighbouring coasts, and the Alps, for plants; and soon became acquainted with Tournefort, then on his botanical tour, and with Garidel, professor of botany at Aix. When he had thus qualified himself, he was chosen as the associate of Surian, to explore the French settlements in the West Indies, as Sloane had lately examined Jamaica. He acquitted himself so well that he was twice afterwards sent at the expence of the king, whose botanist he was appointed, with an increased salary each time. Plumier passed two years in those islands, and on the neighbouring continent, but principally in Domingo; and made designs of many hundred plants, of the natural size, besides numerous figures of birds, fishes, and insects. On his return from his second voyage he had his first work published at the Louvre, at the king’s expence, entitled, 1. “Descriptions des Plantes de PAmerique,” fol. 1695, pp. 94, 108 plates. These figures consist of little more than outlines, but being as large as nature, and well drawn by himself, produce a fine effect. On his return fro/n his third voyage he settled at Paris, and in 1703 published, 2. his “Nova Plantarum Americanarum Genera,” 4to. In the year ensuing he was prevailed upon by M. Fagon to undertake a voyage to Peru, to discover and delineate the Peruvian bark. His great zeal for the science, even at that age, induced him to consent; but while he was waiting for the ship near Cadiz, he was seized with a pleurisy, and died in 1704. Sir J. E. Smith says, that as Rousseau’s Swiss herbalist died of a pleurisy, whilst employed in gathering a sovereign Alpine remedy for that disorder so it is not improbable that Plumier was extolling the Polytrichum (see his preface, p. 2.) as “un antipleuritique des plus assurez,” when he himself fell a victim to the very same distemper; leaving his half-printed book to be his monument. This was, 3. “Traité des Fougeres de l’Amerique,” on the Ferns of America, 1705, folio, 172 plates. He published, as above-mentioned, 4. “L’Art de Tourner,” the Art of Turning, Lyons, 1701, and republished in L740. 5. There are | also two dissertations by him, in the Journal des Savant, 1694, and that of Trevoux, to prove, what is now well known, that the cochineal is an insect. 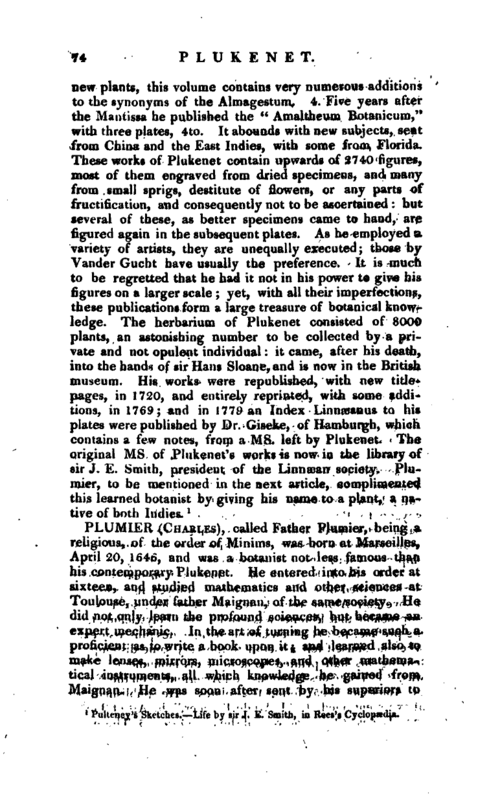 The above works contained but a small part of the productions of Plumier’s pencil. Vast treasures of his drawings, in outline, have remained in the French libraries, for the most part unpublished. The late earl of Bute obtained copies of a great number of these, which after his lordship’s death passed into the hands of sir Joseph Banks. Boerhaave had previously procured copies of above 500, done by the accurate Aubriet, under Vaillant’s inspection, which were, afterwards, in great part at least, published by John Burman at Amsterdam, between 1755 and 1760. These plates are executed with tolerable, but by no means infallible, accuracy, being far inferior in neatness and correctness to what Plumier himself published. The wellmeaning editor has overloaded the book with descriptions pf his own, necessarily made from the figures, and therefore entirely superfluous. They are indeed not unfrequently founded in misapprehension nor has he been very happy in the adaptation of his materials to Linnaean names and principles. 1 Life by sir J. E. Smith, in Rees’s Cyclopædia, Pultensy’s Botany. 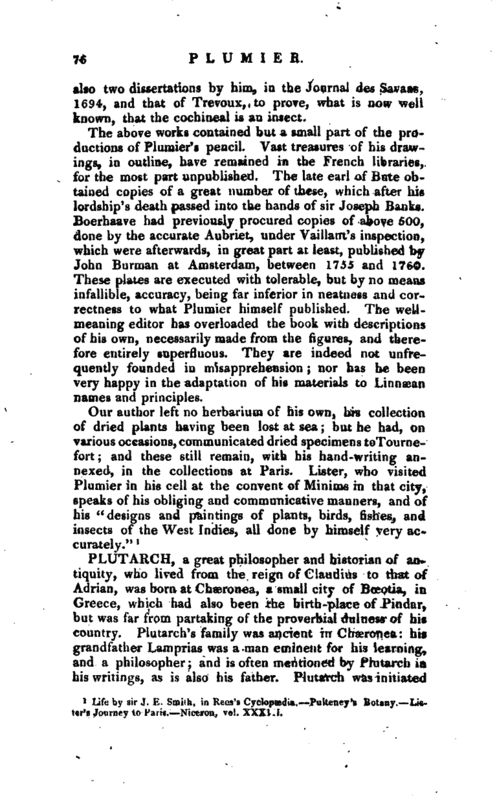 Lister’s Journey to Paris. —Niceron, vol. XXXI II.